If you’re a keen gardener, you may already have come across the National Garden Scheme’s (NGS) Yellow Book or even visited some of the many gardens that open each year across the UK to raise money for charity. 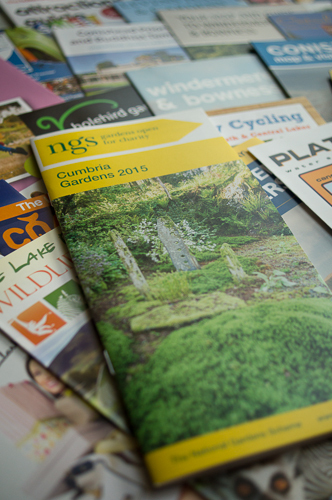 It was great to see the 2015 Cumbria NGS guide appear in leaflet racks across the county a short while ago, and judging by the number of listings inside, it looks like a good year for the area. Let’s hope the weather doesn’t let us down, although I have been known to enjoy an open garden even in the pouring rain! So what sort of gardens have we got in Cumbria? Probably a much broader range than you would think. The guide is full of both privately owned plots – ranging from the small-but-perfectly-formed to the enormous – and gardens which are either charitably or commercially owned. Also interesting, are the extremes we have across the county. For instance, Yewbarrow House in Grange-over-Sands, opening four times this year, has the most amazing microclimate, which as its own website says means conditions for growing are ‘closer to Cornwall than Cumbria’. The garden is 4 1/2 acres altogether, of which half is woodland, and last time I visited, which was in September 2013, I was particularly taken aback by the hot Mediterranean colours and stunning amount of growth within the Italian garden. There are a number of features to visit here including an orangery, kitchen garden and Japanese area with stunning views across Morecambe Bay. There is also the ‘Prospect Tower‘, a fun castle-like structure with stone steps spiralling around its exterior, and unique views all of its own from the top.